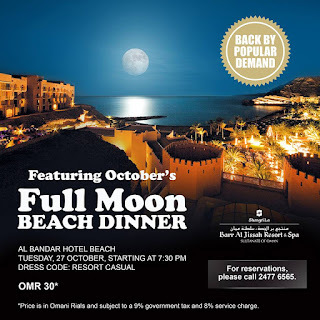 Coming up this Tuesday night (27th October) is the first of the winter season's Full Moon Parties held at the Shangri-la hotel. It's a great event and was very popular before so I imagine it'll be just as popular now. The dinner kicks off at 7:30pm and costs RO 30++ - it's a bbq dinner on the beach with free-flowing drinks and live entertainment from the Battle of the Bands winner, The T-Band as well. If you'd like to go, you can make a reservation by calling 2744 6565.